You may want to let visitors to your blog know what websites you frequently read or bookmark. You can add a list of links, also known as a blogroll, to your sidebar with a Link TypeList. If you have a long list of links, you may want to look into a third-party social bookmarking tool. Social bookmarking services make it easy to add a new link to your favorites and allow you to add the list of links to your blog. 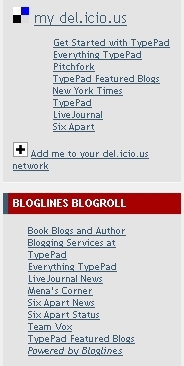 del.icio.us offers a widget, to easily add your Link Roll to your blog. Other widgets from del.icio.us include a Tag Roll and badge. You'll find more information on how to integrate del.icio.us with your TypePad blog here. Other services, like BlogRolling, provide you with HTML you can add to your blog sidebar with a Notes TypeList. Bloglines is an online feed reader that also offers you the option to Share Your Blogroll. After adding the blogroll script to your blog using a widget or TypeList, the list will automatically update when you add a new link to your social bookmarks. This keeps you from having to update your blog each time you find a new website. Podcasting with TypePad is very easy. All you need to do is insert an audio file in a post, publish it and you have just started your very own podcast. TypePad does the heavy lifting for you by adding podcasting enclosures to your weblog's RSS feed. For a great example of a TypePad blog with a podcast, check out TypePad Books. What we love most about podcasting with TypePad, besides how easy it is, is how we can use the fields in a post to enhance a podcast. 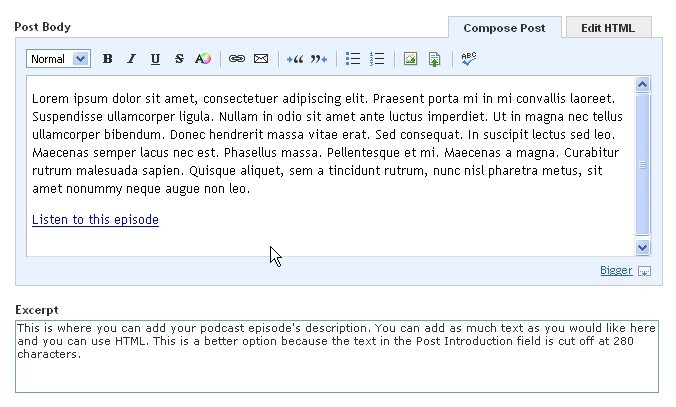 For example, the text that represents the podcast episode's description in your aggregator comes from the content in the Post Body field by default. But by using the Excerpt field, you can display a custom description for your podcast's episode. This way you can include what you want in the body of your post, without worrying about how it will affect the episode's description. You can find this and other podcasting tips in our knowledge base. You can also add an extra touch to your podcast's weblog by incorporating the del.icio.us streaming player for your MP3 files. This particular MP3 player is lightweight, easy to install and also allows users to easily tag your posts in del.icio.us. TypePad continues to grow by leaps and bounds, and it's time for some upgrades. On Monday night February 26th starting at 10:00 pm PST we'll be taking the TypePad application offline for approximately two hours to perform routine maintenance and add some bright, shiny new hardware. During this time blogs will be available for reading, but you won't be able to log in to TypePad to manage or post to your blog, and readers won't be able to leave comments or send TrackBacks. We'll be posting updates to status.sixapart.com, so tune in if you're interested. Thanks for your patience as we continue to grow TypePad! Update, 12:30 am: We went a bit over our targeted two hours, but we're back up and we're running on some brand new hardware. Thanks for your patience! You’ve heard all about the great new widgets that are available for use with your TypePad weblog, but you’re not sure how to start using them? The Knowledge Base is here to help you! Widgets are a great way to add all kinds of extra functionality to your weblog. With widgets, you can do everything from placing customizable polls in your sidebar to highlighting the television shows you watch. You can even turn your entire blog into a widget! Most widgets are very simple to add to your weblog. You would first go to our ever-expanding Widget Gallery and choose the widget that you would like to add. Click the "Get This Widget Now" button and you'll go through steps to configure your widget. You'll then usually be presented with a button or an option to install your widget, which will take you to the "Add a Sidebar Widget" page within TypePad, where you select the blog you'd like to use the widget for. If you have questions about configuring or using widgets, we encourage you to open a help ticket by going to your Control Panel and then clicking the Help tab. The Knowledge Base is written, edited and maintained by the support team and we’ve filled it with our most frequently asked questions. Much of what’s in the Knowledge Base are issues that have come up in help tickets, ideas we’ve gotten from users, or tips that we’ve come across in our own experience. It covers a wide range of topics, from the basic steps of using each feature, to more advanced tips and ideas to help you make the most of your TypePad blog. There are articles to help you incorporate new design elements, troubleshoot problems you may be having, and even a TypePad Glossary of Terms to help you learn the lingo. We make an effort to update the Knowledge Base several times throughout the week. The easiest way to see the newest additions is to subscribe to the feed, which is updated at the end of each day. That way, you’ll have links to the most current information right in your feed reader. Also, new and updated articles are marked as such in the Knowledge Base, so look for those labels while browsing. You will also notice that at the bottom of each article, there is a section for “How well did this answer your question?” This is where you can provide your own feedback about the article and let us know what you found helpful about it, or what we can add or change to make it better. The comments you provide come directly to us and we’ll use your input when editing or updating the article. Please note that this should be used for feedback only. If you have a question and wish to contact us, please file a help ticket via your account’s Control Panel. The Knowledge Base is growing each day and we encourage you to use it as your first step in getting help with any issues or questions you may be having. Interested in spreading your blog's headlines around the web? 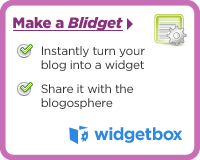 Last week our friends at Widgetbox introduced a really easy way to turn your blog into a viral Widget -- they call them "Blidgets." Widgetbox has built a custom "Blidget maker" for TypePad users, and it couldn't be easier to use. Just give Widgetbox your TypePad blog URL, pick your layout and color preferences, optionally select an image to spruce up your Widget, and in no time you'll have your Blidget listed in the Widgetbox directory. And when you're through configuring your own Blidget, check out the other Widgets that are available at Widgetbox; we've partnered with them to make it easy for you to install any of their Widgets on your TypePad blog.